The Swedish Vallhunds are a short, stocky and fearless Spitz breed of dog, believed to have originated more than 1,000 years ago during the age of the Vikings in Sweden. However, they were brought to the Wales, the orgin of the similar looking Corgi about 800 years ago They were bred to herd the cattle or catch the unwanted vermin on farms. 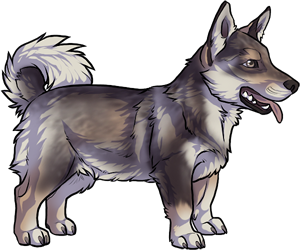 Swedish Vallhund's were near extinction in Sweden in 1942 before being restored by limited individuals. These dogs can come with a variation of tails- bobbed, stubbed or curled. Swedish Vallhund's have also been known as the Vasgotaspets/Swedish Cattledog.